I love Osamu Tezuka and pretty much buy everything published from him when it comes state-side. 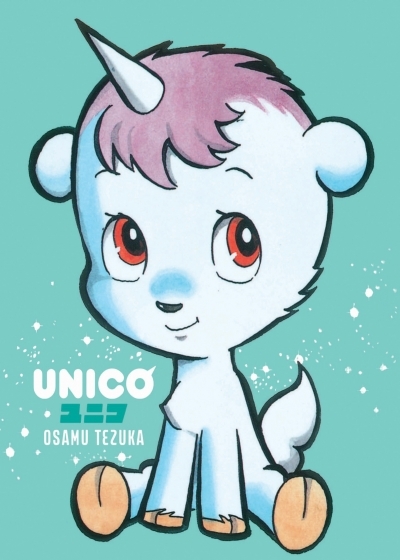 The latest offering I picked up was Unico. This is a 400-page omnibus paperback that collects the complete run of the series, originally funded by Kick Starter, and published by DMP. While I am a big champion of all-ages titles, there are those few that are just a bit too cute, to the point where they kind of grate on your teeth. And unfortunately Unico falls under that umbrella. As a unicorn, Unico brings lifelong happiness to anyone who loves him, and when jealous Venus sees how happy the beautiful Psyche is to be with him, she snatches him from her, and whisks him away, with no memory, across time and space. 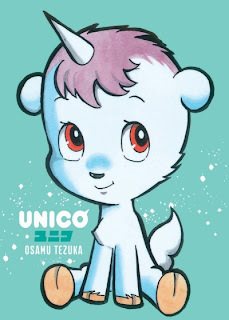 Unfortunately for her, Unico is so kind and lovable that everywhere he finds himself, he manages to find someone to love him and bring happiness to, so he is continually being transplanted to a new life, with no memory of the previous ones. This gets very repetitive after awhile. The scenarios are slightly different each time, with a different era as the backdrop, whether it be the American West or Imperial Russia, but he faces the same problems time and again, and everything tends to be wrapped up with a neat little bow. And every time, Unico begs for a little more time to see his friends to happiness, which he always manages. So, the variety is really lacking in this book, especially by the end of its 400 pages. It would help if Unico was an interesting character, but he is just so passive, wanting only to be loved and be kind. This is, however, a children's book, so I want to give it props for being an enjoyable, light read with Disney-esque characters that kids will like. And the cinematic storytelling keeps you turning those pages quickly. But as a $35 omnibus aimed at collectors, this is definitely a work that fans can skip. I will say that Tezuka's art is stunning in this volume, and as it's presented here in full-color, we get some breathtaking scenes as a result.